SEATTLE -- Marijuana activists who have longed for decades to end America's drug war pocketed more major victories in the midterm elections Tuesday, with Oregon and the nation's capital approving recreational pot use. The advocates believed they also had another win, in Alaska, as a legal pot measure held a steady lead. The only major loss for drug-law reformers came in Florida and even there, a medical marijuana proposal earned 58 percent - just shy of the 60 percent required to pass. The victories came in a midterm election that saw a low turnout and an electorate that handed Republicans back control of the U.S. Senate for the first time since 2006. The results emboldened marijuana activists as they prepare legalization efforts in California, Massachusetts, Maine and other states in the next presidential election year. "We're starting work right now for 2016," said Joe Brezny, who's leading a campaign to legalize marijuana in Nevada. "The other side is in trouble if we're doing this well in a Republican midterm year." Legalization opponent Kevin Sabet called the votes "a bit of a wake-up call before 2016," noting that drug policy groups had spent millions on the legalization campaigns, vastly outspending opponents. "This is going to make our side redouble our efforts to find donors who can put forth real money," said the president of Smart Approaches to Marijuana, adding that if they can get the resources to get their message out, voters could make informed decisions. Sabet pointed to the result in Florida as well as votes in five Colorado cities banning marijuana dispensaries in saying, "I think we've slowed the legal marijuana freight train." The measures were among many that appeared on ballots, with voters approving ones to raise the minimum wage in four states, passing expanded gun background checks in Washington state and rejecting abortion-related measures in two states. In California, drug war opponents welcomed a vote that reduces penalties, from felonies to misdemeanors, on possession of small amounts of drugs - including cocaine and heroin. The pot votes, however, were considered by many to be the first real test of marijuana reform's popularity since Washington state and Colorado passed the nation's first legal pot laws in 2012, boosted then by the higher turnout among young people typical of presidential election years. 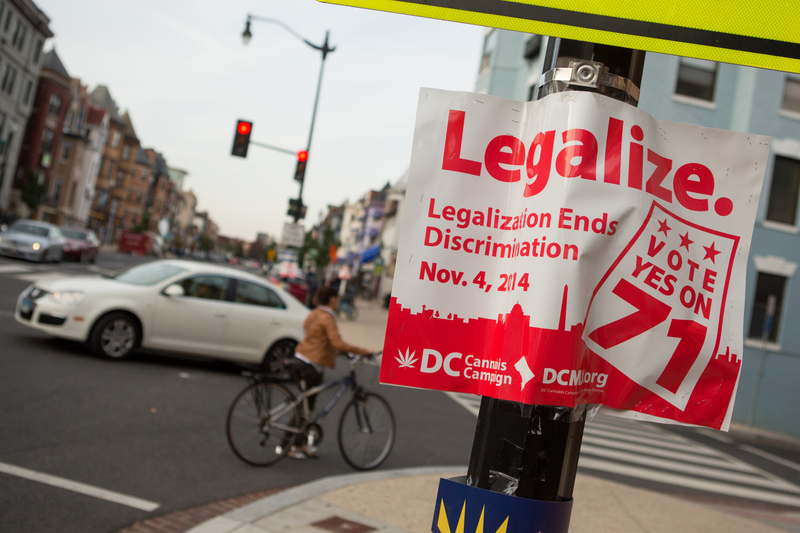 Tuesday's vote saw voters in the District of Columbia make it legal to possess up to two ounces of pot and up to three mature marijuana plants for personal use, but it does not provide for the legal sale of marijuana. That's left up to the D.C. Council. "It was an extraordinary day for marijuana and criminal justice reform, and all the more remarkable on a night the Democrats were getting beat up so bad," said Ethan Nadelmann, executive director of the Drug Policy Alliance, a major legalization backer. Some voters in Alaska said marijuana was essentially legal in the state anyway, thanks to a 1975 state Supreme Court decision that possession of small amounts in the home is protected by citizens' right to privacy. "It's just a waste of cop time and court time and it's pretty much harmless, as far as I'm concerned. We'll break even on making money on taxes on it," voter Scott Jenks said. Gayle Boyer, who said people shouldn't be arrested for using marijuana, voted against the measure, saying there were too many unanswered questions about legalization - and the experiments going on in Colorado and Washington state. "We need to let them be the guinea pigs," she said. Colorado allowed sales to begin at the start of the year, by letting its already-licensed medical dispensaries begin selling for recreational use. There have been some concerns over the strength of edibles sold, prompting plans for new rules there. In Washington, where there is no regulated medical industry, legal marijuana's rollout has gone more slowly. Colorado voters rejected a measure that would have required labeling of certain genetically modified foods. The proposal would have applied to raw and packaged foods produced entirely or partially by genetic engineering, but not apply to food served in restaurants. A similar measure was too close to call in Oregon. In Hawaii, voters in Maui County opted to temporarily ban the cultivation of genetically engineered crops after a campaign featuring $8 million in advertising from some of the world's largest corn-seed producers. Voters in Berkeley, California, became the first in the country to pass a tax on sodas and other sugary drinks. High-dollar advertising campaigns by the $76 billion U.S. soft-drink industry had defeated the proposal in more than 30 other cities and states in recent years, including San Francisco where voters on Tuesday rejected a soda tax.